WHERE IS IRON JOHN NOW? Twenty five years have passed since the first Minnesota Men’s Conference and what has happened? Men’s work began by asking what sort of fathering and mentoring was possible for young men inside their own families and within the culture as a whole. There is a deep hunger for intelligent leadership from adult men. It seems clear that many men have become involved in the complicated work of fathering and mentoring young men and women, yet it is also clear there's a lot more to be done. 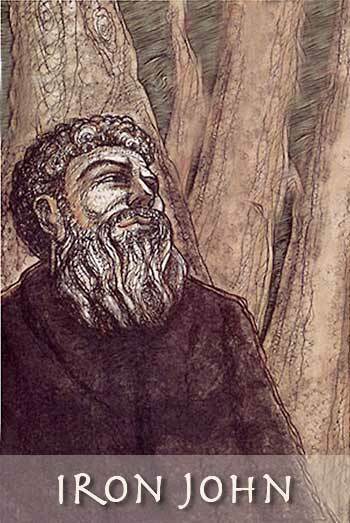 In the early 80's Robert Bly used the story of "Iron John" to lay out a map of the soul's journey in maturing the deep masculine. This year as we retell the story “Iron John”, we will ask those new to this story, and those who have lived it: 'Where are we now in this story? What is valuable about this story of Iron John?' What other stories do we need? Eleven gifted teachers will collaborate and celebrate this 25th Anniversary of the Conference. Mythtellers Daniel Deardorff and Martin Shaw will join with Robert Bly in a wild three-way retelling of the "Iron John" story. John Lee will offer his profound insight into how we can navigate the trouble of regression and men's anger. Miguel Rivera, with his deep feeling for the indigenous world of nature and ritual, will help us stay connected to these primary sources of the masculine heart. Orland Bishop returns with his eloquence and extensive experience with at-risk youth to show us a path toward the mentoring of youth. Tom Gambell, with his compassionate, open-hearted Aikido, and Doug Von Koss, with his love song arrows, will engage us in two ancient expressions: the power of movement and the power of song. Timothy Young, Thomas Smith, and Jay Leeming will lead us through the forest of words to find our own poems of depth and praise. Daniel Deardorff : As a gifted singer, musician, and storyteller, he brings the luminous mythological to the conference. Danny Deardorff carries mysteries into a new place. "Myth is a story that tells a sacred truth without the use of facts." Jay Leeming is the author of Dynamite on a China Plate, a book of poems published by The Backwaters Press. His poems have appeared in a variety of magazines including Ploughshares, The Gettysburg Review, Poetry East and Black Warrior Review. He has been a featured reader at Butler University, the Omega Institute, Robert Bly’s Great Mother Conference and the Woodstock Poetry Festival, and is the recipient of a Creative Writing Fellowship from the National Endowment for the Arts. He lives and teaches in Ithaca, New York. Doug von Koss joyously returns again this year to lead early morning chanting. Many participants return to this conference just to begin each day in “one voice” under his guidance. He teaches the vowel sounds as well as chants from the Near East and the West. He has published two CD's and a songbook, and travels widely to bring the magic of voice to communities worldwide. Join for a special tour of Bali each year! Greet the sunrise with him each day in a whirling circle of song! Martin Shaw will be teaching from his brand new book 'A Branch From The Lightning Tree: Ecstatic Myth and the Grace in Wildness'. In it he is claiming we are societally addicted to the act of severance and have replaced Longing with Disappointment. This, in turn, creates a defense against our own beauty. For a step towards authentic leadership in men he is suggesting the ancient idea of a 'Road of Solitude and Road of Voice'; a cherising of silence, wilderness and interior listening met with the ability to articulate clearly and passionately the desires of our own lives. With a cluster of Initiatory myths, deft commentary and time on the land, Shaw proposes a 'Culture of Wildness' is possible, indeed vital, for a restoration of soul in men's lives. John Lee is a leader in raising awareness of men's issues in psychology, psychotherapy, personal growth, and recovery, and this year will bring our attention to passivity in men as one of the most overlooked, un-discussed, and un-diagnosed and least understood issues. The passive man operates, participates and creates at half of their capacity and potential. They are out of balance between work, relationships, self-care and community. Men can often become aggressive or violent to prove they are not passive. At this conference John Lee will present ideas and show us experiential exercises on how men can overcome passivity & become compassionately assertive. John is the best-selling author or The Flying Boy: Healing the Wounded Man, which reveals why men run from relationships. He has also published fifteen other books on relationships, recovery, spirituality, creativity and anger. John Lee is not only a writer, personal life coach and consultant, but a poet, a teacher and a humorist. A basic principle John teaches is how to stay true to yourself and listen to what your body is telling you. Too many of us live “intellectual” lives, but we forget that a person needs to have a spiritual, emotional, physical and creative life. John taught at the universities of Texas and Alabama and maintained a private practice and founded The Austin Men's Center in Austin, Texas. Timothy Young, poet and teacher, lives and works in Minnesota. 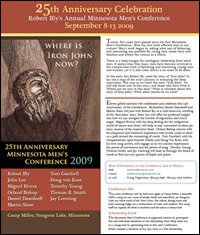 The Thousands Press, with the Minnesota Men's Conference, published his book of poems, Building in Deeper Water, in 2003. Red Dragonfly Press will publish his next book, Herds of Bears Surround Us. OA2 Jazz Records recently released PULSE, a jazz big band CD by the composer and band leader, Dan Cavanagh, which includes Mississippi Ecstasy, a three-movement suite scored for Timothy's poem, and with Timothy on vocals. At the Minnesota Correctional Facility in Red Wing he taught juveniles and retired late 2004. In 2005 Timothy started The Two Boots Poetry Tour. With other poets and musicians The Two Boots ventures into libraries, schools, correctional facilities and other venues. He has been with the Minnesota Men's Conference in many capacities for its entire twenty-five years. By Air: If you are traveling by air, you will be arriving at the Mpls/St. Paul International Airport. We have reserved a charter bus to take you to and from the camp. The cost for this is $80 paid in advance. The bus will be at the airport by 3:00 pm on Tuesday, Sept. 8th and will leave for the camp by 3:30pm. The bus will return to the airport on Sunday, Sept. 13th no later than 3:30pm. Please try to arrange your flights so that you arrive at least 1 hour before the bus departs from the airport and 1 1/2 hours after the bus arrives back to the airport. The Seventh Shrine: Meditations on the African Spiritual Journey..